Q: Can first graders handle keyboarding? A: Yes! Most first graders find keyboarding easier than using a pencil. Typing is often easier for first graders than fourth graders, because they haven’t yet formed the “hunt and peck” habits that can create frustration and delays later on. Q: How will the Read, Write & Type help my child? A: RWT offers a revolutionary approach to learning to read and write, based on a multi-sensory method that combines phonics with whole language and the skills of reading and writing with keyboarding, spelling, grammar and punctuation. Q: How does the Read, Write & Type compare with other reading methods? A: No other reading program compares to RWT Most programs require a huge investment of time, use boring drill-and-practice techniques, teach only a few hundred words, have primitive graphics, and only offer “canned” help like “That’s not it, try again.” RWT is easy to use, fun, interactive, and can diagnose your child’s strengths and weaknesses and prescribe appropriate activities. Simply put, Read, Write & Type is the most effective reading method available for your child. Q: Does the Read, Write & Type work for children of different ability levels? A: Absolutely. RWT was designed by a neuropsychologist to have multiple “safety nets” and be effective with a wide variety of children. Children learn at their own pace, with highly motivating games and feedback. Q: Can I assess my child's progress within the Read, Write & Type? A: Yes! The Bonus Blimp keeps track of performance and sends children back to activities they may need to practice. The Hall of Fame Certificates show what levels have been completed, and the Power Fountain keeps track of keyboarding speed and accuracy. Q: Can the Read, Write & Type be used with ESL and bilingual students? A: The Read, Write & Type is specially designed for children making a transition to English, because they see, hear and type sentences that familiarize them with new vocabulary words as well as the syntax, spelling, and punctuation of English. In addition, RWT has built-in help and instructions in Spanish, Arabic, Farsi, Korean, Japanese, Mandarin, Portuguese, Tagalog and Bahasa Melayu (the language of Indonesia and Malaysia). Q: Why is the Read, Write & Type so successful? A: Associating each speech sound with a finger stroke is a very powerful teaching strategy that incorporates “motor memory”. RWT lets children use a range of senses—their eyes, ears, mouths and fingers—to learn phonics while writing whole words and sentences. Frequently Asked Questions about Wordy Qwerty – from Talking Fingers, Inc.
Q. What uniquely sets Wordy Qwerty apart from the hundreds of software reading products? A. Wordy Qwerty — Foundations for Reading and Writing Fluency, demystifies spelling and makes it fun to learn to write and read words. It capitalizes on the importance of spelling as an essential component of reading and writing fluency. Wordy Qwerty is targeted at 7 to 10 year olds who have learned the basics of phonics and word identification and are poised to master more complex reading and writing skills in order to become enthusiastic and capable readers and writers. It uniquely uses a writing-to-read approach in order to provide individualized feedback and to activate and connect essential areas of the brain. Two engaging characters, Midi the musician and Qwerty the word coach, enlist children to help them accumulate the “spheres” that are needed to play Midi’s music machine. Children do this by successfully mastering six activities in each of twenty lessons. They learn to recognize patterns in words, type to dictation, write and read stories, and listen to and sing songs that will help them remember how words are spelled and pronounced and what they mean. Q. Where can I go to get a quick demo of Wordy Qwerty? Q. Can any 7 to 10 year old child pick up and use Wordy Qwerty? A. Yes, any 7 to10 year old can use the program. They’ll do even better if they’ve learned keyboarding, phonemic awareness and basic spelling conventions first, with our flagship Read Write & Type program. Q. Is Wordy Qwerty research-based? A. Yes. 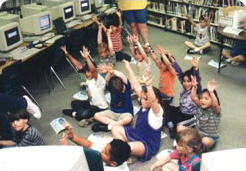 Research with Wordy Qwerty was conducted by reading specialists at Southern Methodist University, in Dallas, Texas, as part of the development of the program. Wordy Qwerty‘s creator, Dr. Jeannine Herron, Ph.D., has 30 years experience in brain and reading research. Her approach has been tested and proven successful through research using Read Write & Type, in public schools across California, as well as through research by noted reading specialist, Joseph Torgesen, at Florida State University. Research with both Read Write & Type and Wordy Qwerty have been funded by private foundations as well as the National Institute of Child Health and Human Development (NICHD). Q. What will children get out of Wordy Qwerty? A. Researchers report that fluent readers and writers access the words they read and write from a “database” located in the left hemispheres of their brains. This database stores both the sounds and meanings of the words we read and write. Wordy Qwerty helps children build and automatically access this invaluable left-brain data. They see, hear and type scores of words, individually, in sentences, and in stories. They store the motor memory of typing, and the sound, sight and meaning of each word in their brains, for future reference. Wordy Qwerty uses games, songs, rhymes, storytelling and rewards to teach children 20 spelling rules, introduce them to word families, and identify the “outlaw words” (words that do not conform to spelling conventions and must simply be memorized by sight). As they master these concepts, the world of reading and writing widens beyond belief. Children fearlessly and confidently tackle new words because they have learned the rules and strategies that will help them succeed. The skills Wordy Qwerty fosters will remain embedded throughout their lifetime. Q. What is the Talking Fingers, Inc. approach to reading and writing? A. The Talking Fingers approach to reading and writing is based on a simple idea: Text is speech made visible. We use our mouths to talk, to make the sounds of words. We use our fingers (with a pencil or keyboard) to represent those sounds on paper. There are roughly 40 sounds (or phonemes) in English. It takes only 26 letters to stand for those sounds, to make any spoken word visible. When children learn to link those sounds with letters, they can use the alphabet code to write any word they can say. Their fingers are “talking”. Q: Can I use this app on a tablet as well as a computer?